It is so hard to believe that it is going to be the 30th Anniversary of Voltron. The 1980's are filled with some of the greatest cartoon series, and Voltron was definitely one of those. 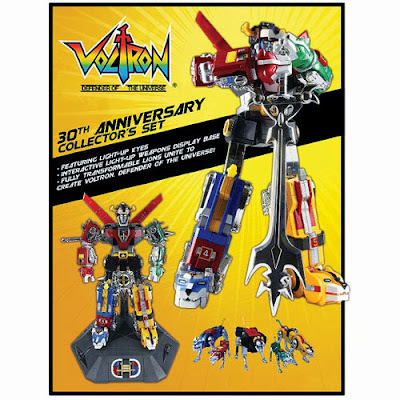 Everyone seemed to have that giant Voltron and it was truly one incredible toy because of the size and because you could take each Lion to form that gigantic robot. Toynami is doing it right for all the Voltron fans and have created a special 30th Anniversary Voltron Die-Cast Light-Up Action figure. 5 lions combine to form a light-up, 11-inch tall die-cast metal Voltron! Signature badge becomes key that activates the lion's roar sound on display base. Includes individual Blue, Red, Black, Green, and Yellow Lions! 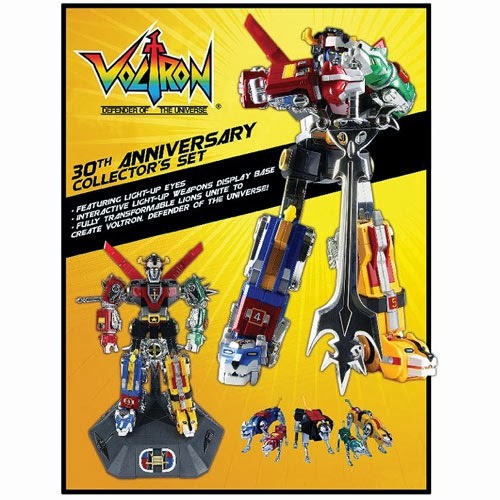 Commemorate the 30th anniversary of the U.S. release of the giant robot anime series Voltron with this awesome Voltron 30th Anniversary Die-Cast Light-Up Action Figure with Sound Collector's Set! 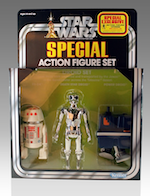 This die-cast metal action figure set includes the Blue, Red, Black, Green, and Yellow Lion. Combine all 5 action figures to form Voltron, Defender of the Universe! The united lions form an 11-inch tall Voltron with light-up eyes (powered by replaceable batteries) and a very special signature Voltron badge. When Voltron is properly transformed, the badge becomes a key that can be used to activate light and sound features on the display base, including the legendary lion's roar! The Voltron 30th Anniversary Die-Cast Light-Up Action Figure with Sound Collector's Set comes with the lion's mouth blade weapon accessory.